It’s really happening! You’re going to be a mother-of-the-bride (MOB) or -groom (MOG). Your daughter or son got engaged, and you’ve been invited to be a part of the journey. Let’s explore ten must-have tips that’ll have the newly engaged lovebirds eating out of the palm of your hand. Your daughter emerges from the dressing room, and you try to blink back the tears. What if it comes down to that dress and another one that your daughter absolutely loves? Pat her hand and tell her how beautiful she looks. It’ll be worth it when she gives you a grateful smile. Those “to-do” lists are daunting! But don’t hesitate to sit and talk with your daughter or son. It might seem like you’ve got less pull as the Head Mother in Charge, but you might find that they really appreciate your emotional support during this hectic season of life. Lace isn’t only for the bride. 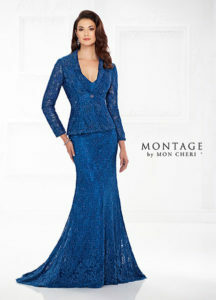 Mother-of-the-bride designers are incorporating lace on bodices, on straps, and as an allover effect. Chantilly lace, Alençon lace, and other variations are the latest trends in MOB dress design. The luxurious, detailed designs add an element of romance while keeping a sophisticated look. At Molly’s Bridal, you don’t need an appointment to have a consultation with a stylist in our Special Occasion department. Find out more about our mother-of-the-bride selection.